The Miramar Theatre in Havana is a major project of the Music Fund for Cuba. Following a seven year renovation programme and £334,000 worth of funding from the charity, the theatre reopened in March 2012. In the last few years it has hosted hundreds of performances and film screenings by community groups and students from the nearby music and performing arts schools to national and international touring artists. Although funding of the main building work has been completed, the Music Fund for Cuba continues its links and support for the theatre, both through the seat plaques that british friends have dedicated, and continuing to fund maintenance, including recent repairs to the roof and lighting systems. 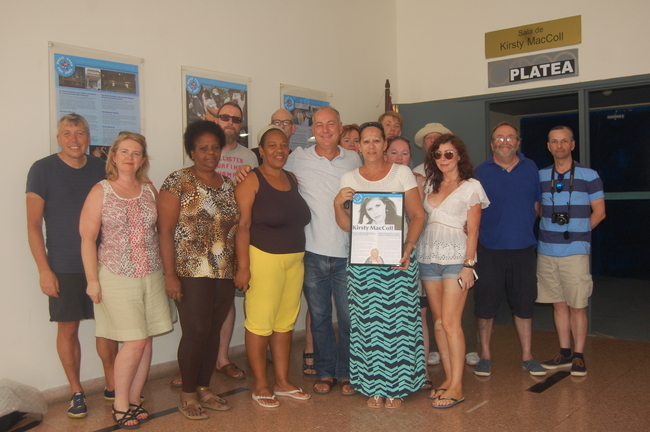 In May 2017, Rob Miller, MFFC director visited the theatre to present a new display for the foyer on the life of singer Kirsty MacColl, in whose memory the MFFC was established, and theatre auditorium named after.